I was happy to be invited to speak at the United States Concealed Carry Association’s annual event, which took place in Louisville, KY this year. 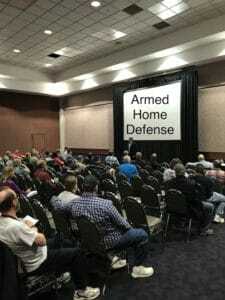 I spoke on Armed Home Defense and put a focus on a plan being much more than having a gun! If our ultimate goal is to keep ourselves and loved ones safe during a break-in, then we have to make sure our choices are not only helping us reach that goal but are also keeping the risk level as low as we can. Are you a member of the USCCA? While there, Deryck Poole and I were asked to do a live podcast with Riley Bowman and his ConcealedCarry.com podcast. We discussed defensive shooting, home defense and more.